An alternative and very sensitive test is by means of an alloy with two major Copper/Zinc phases separated by an atomic number difference of 0.1. 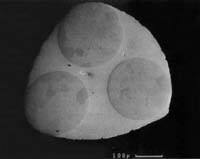 The light phase illustrated in the micrograph has a mean atomic number of 29.47 and the dark phase a mean atomic number of 29.37. Aluminum and copper to perform spectral calibration. Carbon to monitor calibration at the low end of the spectra for thin window detectors. You also get two grid sizes for checking the accuracy of your image analysis software and an easy test for monitoring the amount of vacuum pump oil contamination on your detector window. The X-Checker™ BN comes with boron nitride for those who need a more sensitive monitor of low end performance on thin window and windowless detectors. The X-Checker™ Extra is the ultimate performance monitor for the latest state of the art X-ray detectors. In addition to the standard features and boron nitride, there is a fluorine source to test resolution at the fluorine K-alpha peak (industry standard for measuring low end resolution). As well it comes with a beryllium grid for the ultimate test of detector performance.